Ninety-eight Filipino artists from across the country including six OFWs vied for the top prizes in an exhibition competition entitled Narrative of Color 2. The event is organized by the Philippine Guild of Watercolorists and International Watercolor Society Philippines and sponsored by GSIS. Grand Opening and awards night on March 19, 2019 was formally opened by the GSIS Vice President of Finance Ms Lareina Chanel Chingtoco Chua, Guests of Honor are GSIS VP Ms Margie Jorillo, GSIS VP Lucio Yu Jr., NCCA NCAG Execon, Ms Ma. 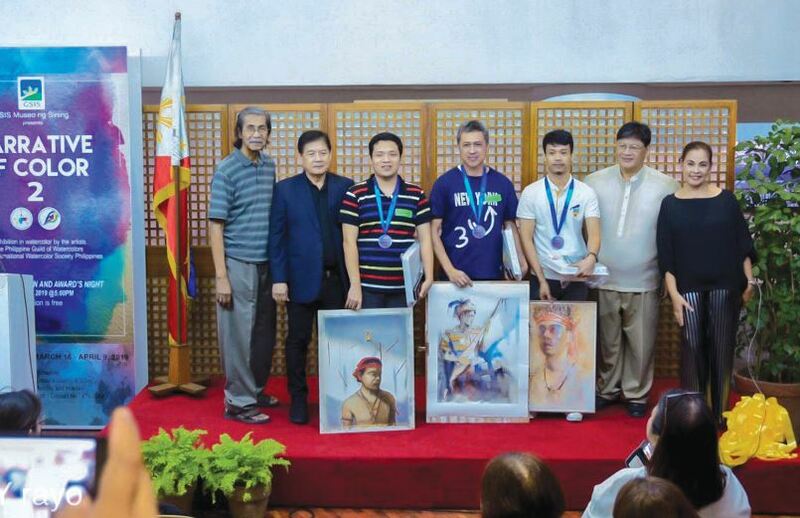 Ivy Ang, Watercolor masters Mr Popoy Cusi, Mr Ernie Patricio. The grand prize winner of the competition is Ms Sarah Liuson Ongsun ( Luzon), 2nd Prize Winner Edbon Sevilleno (OFW), 3rd Prize Winner Mr. Sen Lacson (Luzon), Honorable mentions are Kyle Legaspi (Luzon), Jess Dinglasa (Cebu, Visayas), Erick Mercado (Luzon), Gilbert Miraflor (Davao, Mindanao),Gieward Hulagno (Zamboanga, Mindanao), Alvin De Jesus (Luzon), Ludwig Ilio (Davao, Mindanao). Narrative of Color 2 exhibition will be open to the public, from March 9,2019 to April 9,2019, GSIS Museo ng Sining Lower Gallery , GSIS MAIN OFFICE, Diosdado Macapagal, Pasay City. Museum is open from Tuesdays to Saturdays, 8 a.m. to 5 p.m.
Photo from top clockwise: 155 participants from around the country joined the 3rd National Watercolor Convention from around the country. Cutting of ribbon, from left to right, Danny Doce (PGW IWSP Board member), Buds Convocar (PGW IWSPBoard member), Ernie Patricio(Guest of Honor,Jury in Contest), Rafael “Popoy” Cusi( Guest of Honor, jury in Contest) , Danny Rayos del sol(Guest of Honor, NCCA, NCAG EXECON), Ma. 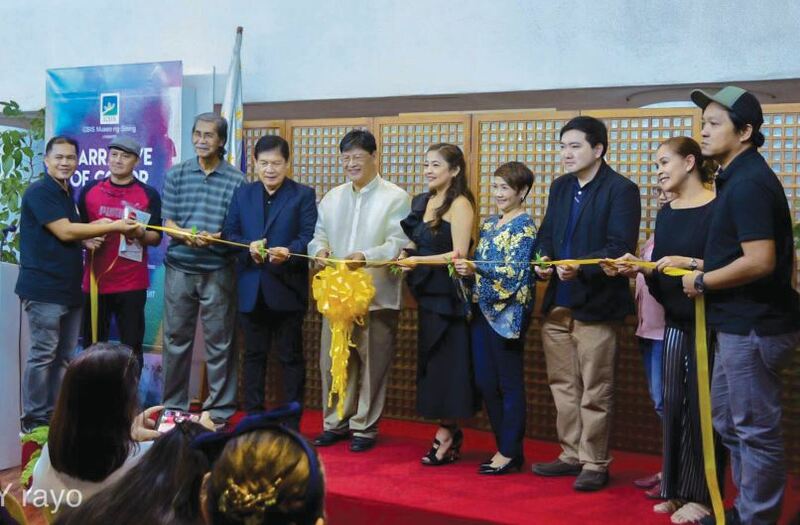 Ivy Ang(Guest of Honor, CEBU Based business woman, Antique dealer art collector),VP MARGE JORILLO, VP LUCIO YU JR, Ella Hipolito (PGW IWSPBoard member), Jinky Rayo (President, PGW IWSP), Julius legaspi (PGW IWSPBoard member). Watercolor competition winners- Ton ton Ador (Grand Prize), Gilbert Miraflor (2nd Prize), Emmanuel Silva( 3rd Prize), Presidential Choice, Jess Dinglasa, Reynan Dingal and Carlo Caacbay.